â€œI give you Chicago. It is not London and Harvard. It is not Paris and buttermilk. It is American in every chitling and sparerib. It is alive from snout to tail.â€? I shouldn’t even have to post this, if you read 2strokebuzz, you know about Galewood. It’s all about scooters and bacon. It’s our neighborhood. It’s our rally. It’s our birthdays. It’s this weekend. 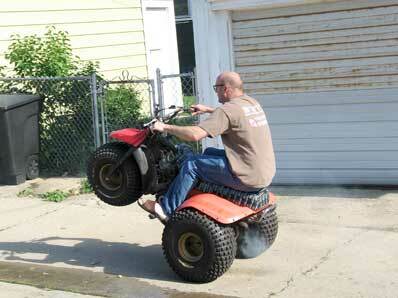 Same deal as usual (though this year we’re adding a Bouncy Castle and a three-wheel ATV.) You know the drill. This will be the last Galewood Rally, so don’t miss it. Read on if you need more info. All are welcome. As Motoplex did not immediately reply to our confirmation request, this information is still hearsay, but such a move seems absolutely consistent with recent changes in Piaggio’s strategy. West Suburban seemed unlikely to add Piaggio brands Moto Guzzi and Aprilia, while Motoplex is already an Aprilia dealer. Old Town Motocycle Shoppe has a prime upscale retail location and employees with motorcycle experience, and Motoplex’ other two dealers may be more accesible to suburban and even rural customers. According to one of our sources, Vespa Chicago’s general manager Dan Kay will move to Motoplex along with Vespa/Piaggio. It is unclear whether Piaggio or West Suburban Auto Group terminated the relationship, why it was terminated, or exactly when the transition will take place. Vespa Chicago opened in 2000, they’ve been Chicago’s sole dealer since Vespa’s return to the United States in 1999. Author illnoisePosted on 14.05.06 14.05.06 Categories Chicago, Piaggio, Scooter News, Vespa8 Comments on Vespa Chicago closing? The spring itch to ride manifests itself via two Chicago-area scooter rides happening next Saturday (April 22): The Heck’s Angels (warning: MySpace) are sponsoring a Benefit Ride for Kalaisha Watrous, and all are wecome to donate and participate. (Info about Kalaisha’s accident.) Also next Saturday is Scooterworks’ annual Spring Ride, (more info to come). I heard some girl behind me on the street the other day say “God, it’s GORGEOUS out” and out of nowhere (without even seeing her) I got the temptation to turn around and say “it JUST GOT GORGEOUS-ER!” but I chickened out. In the greatest PR stunt in recent memory, Allstate Insurance is celebrating their 75th anniversary by paying for parking in the Chicago Loop next Monday. 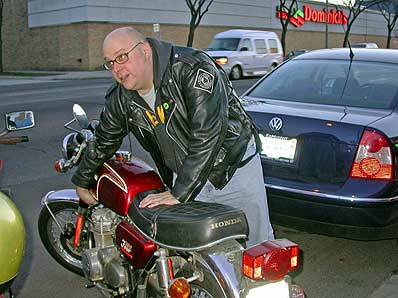 Author illnoisePosted on 08.04.06 Categories 2sb's So-Called Life, Chicago, Motorcycles1 Comment on Breaky is alive! Sunday, 11:30am Nitro’s Top Notch Burger Run, leaves from Rancho Nitro, (3120 N Elston) at 11:30. Inner-city ride, everyone welcome. Author illnoisePosted on 07.04.06 Categories Chicago, Rallies and Rides1 Comment on Reminder- two weekend rides! 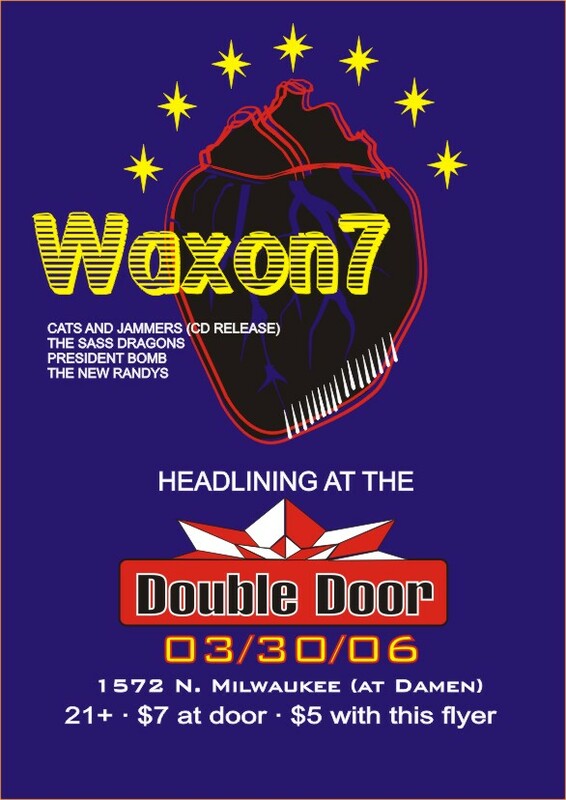 As any longtime 2strokebuzz reader can tell you, Waxon7 is pretty much the house band of Chicago scooter parties. Abe (the “singer”) leaves his desk at Scooterworks every night to become the Patrick Bateman of Rock and Roll, stripping it down like a Lincoln Park Trixie layered-up in JCrew for a Chicago winter. Guitarist Vee Sonnets crashed my wedding in a red velvet suit. The other guys in the band, well, I’ve never heard them speak, they’re barely human, just some vaguely hispanic mutants Abe brewed up in his crawlspace to help him spread the word. Add some barely-legal go-go dancers and a crowd full of scooterists, and any basement shithole they play is magic. Thursday night just might be their definitive show, they’re headlining the Double Door, the biggest venue they’ve ever played. Cover is $7, or $5 with this flyer, and they’re handing out W7 t-shirts to their fans. Don’t miss it. Saturday April 8 Chicago Area Scooterist Motorcycle Ride (for scooterists w/motorcycles or 60mph+ scooters), 3-hour ride through Southwest Chicago, meet at Pontiac Grill, 1531 N Damen Ave., at noon. Saturday April 22 Scooterworks ride and open house, details to come. The Chicago Fire has announced plans for a new $70 million (seven crore for our indian readers) soccer stadium in Bridgeview, IL. Good news for 2SB, that’s about as close to Galewood as we could have hoped for, and it’s near the VFW fish fry, the Krispy Kreme, and the Trader Joe’s that we frequent. The team hopes to play there starting in 2006. Westside! 2sb’s favorite MLS player, defender Carlos Bocanegra, is leaving the Chicago Fire for a three-year deal with Fulham FC in the English Premier League. He’ll be greatly missed by the Fire, but it’s an awesome opportunity and we know he’ll be the greatest Cottager since George Michael.